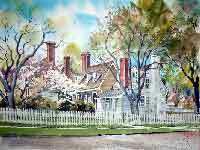 Fred Bees was a watercolorist, teacher and winner of numerous awards. Even though Fred had no formal art education, he taught the media for 33 years at local YMCAs, YWCAs and the Bethlehem Area Vo-Tech. 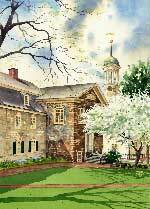 He also taught as an adjunct professor at the Northampton County Community College for several years; as well as having offered courses in watercolor at Cedar Crest College and the Baum School of Art. 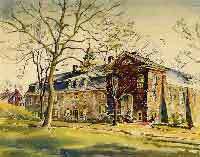 Fred painted the Bethlehem Historic District for over half a century. 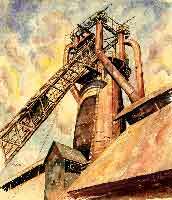 Eight of his paintings were included as illustrations in the book Bethlehem of Pennsylvania - The First One Hundred Years published in 1968. 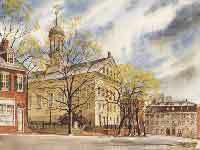 His works have also been used in connection with many other Bethlehem and Moravian College Books and Pamphlets. 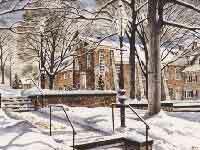 His paintings were also used by the City of Bethlehem for publicity; for example, the Bethlehem Christmas City Stamps (1968, 1976, and 1996). He considered himself an unofficial ambassador of what Bethlehem has to offer, so far as tourism is concerned. In 1997, Fred was awarded a Certificate of Special Congressional Recognition by Representative Paul McHale. 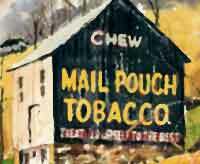 The same year, he was recognized as a charter member of the Bethlehem Palette Club which was founded in 1947. 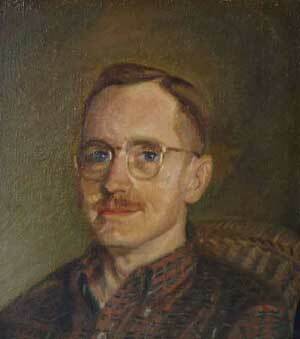 In 1996, the Bethlehem Fine Arts Commission honored Fred as Bethlehems Artist of the Year. He was also recognized as a member of Alumni of Distinction by the 75th Anniversary Committee of his Alma Mater, Liberty High School. 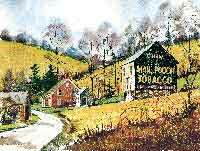 Fred painted on location, in all kinds of weather, for example; in Santee Mill you can read a sign that says, Painted 12/11/77 Temp. 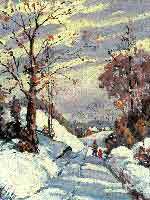 18°. Call 215-598-2828 for more information and pricing. 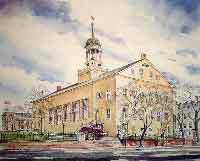 With the outside entrance added post Civil War period, it was built as Bethlehem's second house of worship and has witnessed Indian baptisms, hosted many national and patriotic personages, and has continued to be used for worship, funerals, memorial services, Moravian Academy Chapel and special services. The revitalization of Main Street in 1979 by the restoration of its fine buildings and the provision of site amenities has created a comfortable and pleasant overall human environment. 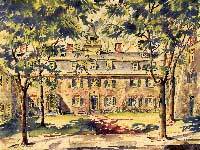 Historic Bethlehem Inc.'s Goundie House is on the left side. There were only 500 residents in Bethlehem;s community when the church was built to accommodate 1500 for worship. The church belfry has become a symbol of Bethlehem. 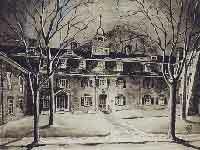 Main Hall dormitory and the Brethren's House (1748), now a part of the College Music Department, are shown to the right of Central Church. The view of this historic street is the most comprehensive in that it includes portions of - from left to right - the Widows House (1766); Central Church with its prominent belfry (1803-06); the Gemein Haus (1741-42) currently the Moravian Museum; Old Chapel (1751) and the original 1744 Sister's House which was originally the Brethren's House until they moved to their and much larger choir house in 1748 at Church & Main Streets. 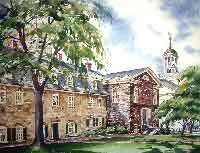 Bethlehem's oldest existing building built as a 5-story log structure to be the center of worship and community life of early Bethlehem. The Gemein Saal was Bethlehem's first place of worship. 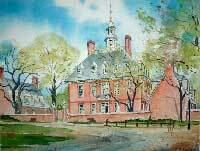 Given a clapboard exterior in the 19th Century, the building has continued to provide a place for residential living (at one time about ninety people lived in this building) and more recently, as the Moravian Museum. The Chapel was Bethlehem's second place of worship (1751-1806) and has witnessed Indian baptisms, hosted many national and patriotic personages. The main outside entrance was added in the 1860's. 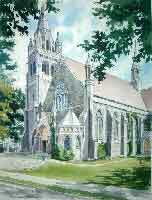 The chapel continues to be used for worship, funerals, memorial services, Moravian Academy chapel and special services. The wrought iron fence in the foreground was a product of the Beckel Iron Works which was located on Sand Island. 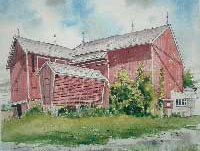 This is a close-up of the barn in the "Mail Pouch Barn" painting. 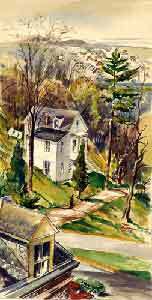 Gemein House - Looking Up Church St.
A gicleé (zhee-CLAY) is an individually produced, high-resolution, high-fidelity reproduction. 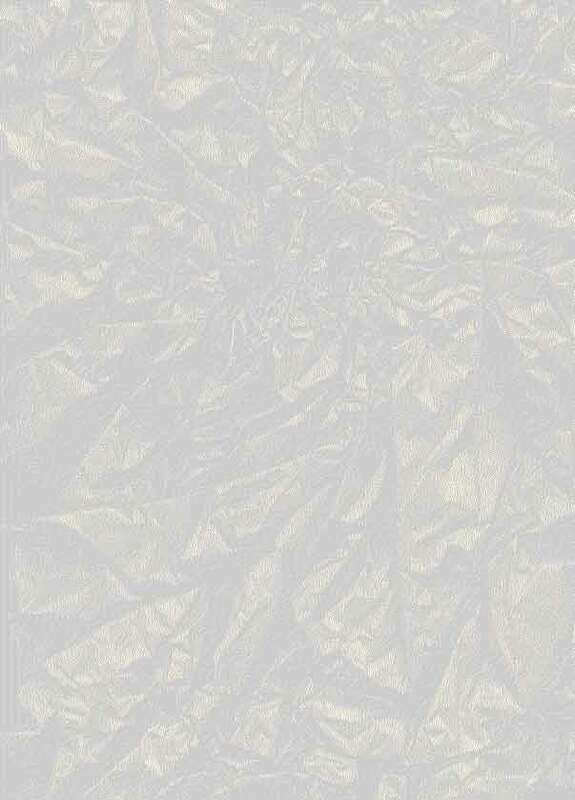 Gicleés can be produced on any number of media, from canvas to watercolor paper to transparent acetates. Some artists have begun to work directly with this new printing process. 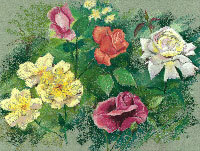 Gicleés are superior to traditional lithography in several ways. The colors are brighter, last longer, and are so high-resolution that they are virtually continuous tone, rather than tiny dots. 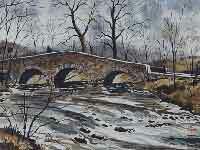 The range, or "gamut" of color for gicleés is far beyond that of lithography. Lithography uses tiny dots of four colors--cyan, magenta, yellow and black--to fool the eye into seeing various hues and shades. Colors are "created" by printing different size dots of these four colors. Gicleés use technology that sprays ink onto the page, actually mixing the inks on the page to create true colors.